In life it is extremely easy to fall into a routine — and the same can be said about trade show marketing. The need for the same-old-same-old is born out of a fear of the unknown, and a fear of failure. You should challenge yourself and your staff with the task of coming up with one fresh idea to implement for each trade show your team attends. 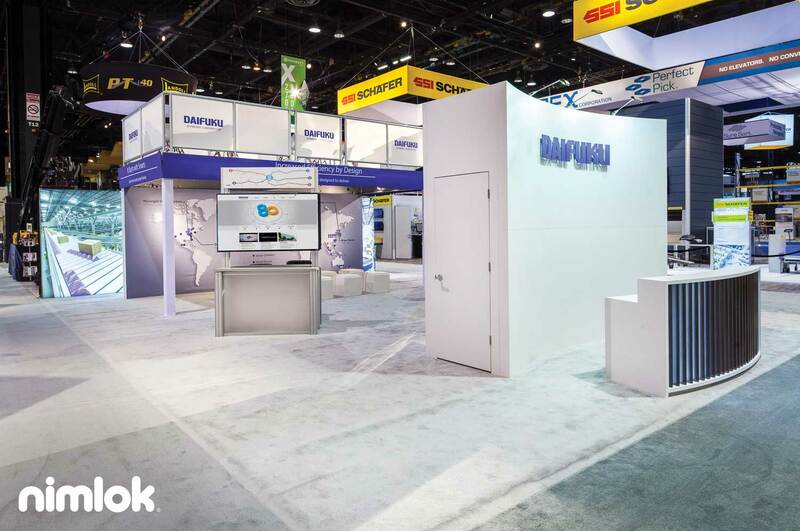 Your ideas can range from radically changing your booth design, to the more mundane like changing up the promotion from pens to cups. By implementing a new idea you will get to see what works and what doesn’t. You need trial and error to grow — so don’t be afraid to venture outside of your comfort zone. Marketing and trade show budgets are usually pretty tight so it’s up to the planners to budget wisely. However, this does not mean that you should go with the lowest bidding vendor or option at every turn. In fact – going the cheap route can sometimes cost you more money down the line. For example, your organizations goal is to increase brand awareness, but you purchase the smallest space you can at the event. By buying small and saving money you can potentially make yourself invisible which would undermine your entire trade show effort. It is far better to pay for quality, efficiency, exposure and professionalism rather than doing things yourself or cutting cost and getting substandard work in return. Technology is great, don’t get me wrong. I mean the only reason you can read this post is because of — you guessed it — technology. But, sometimes we rely on business technology as a crutch rather than an asset. When you walk the floor of a trade show you see monitors flashing cool videos, cameras snapping shots of everything in sight, and all types of gizmos are being used to captivate the attention of attendees. There is nothing wrong with any of this – but you have to remember the most powerful marketing tool any exhibitor has at their disposal is human interaction. Trade shows are called face-to-face marketing events for a reason and you should remember that your best-selling tool is your booth staff and their ability to engage your visitors so make sure your staff can communicate your brands message effectively. So you plan months ahead for your trade show, you get all your ducks in a row and everything goes off without a hitch — great! Now it’s time to pack-it-in and head home for a well-deserved pat on the back — but are you remembering to follow up on all of those great leads you have piled up? Do you have a strategy for post-show engagement? According to the Center for Exhibition Industry Research only 20% of trade show leads are ever followed-up on by exhibitors. That is basically leaving a huge sum of money on the table. Make sure you at the very least try to do one of the following for each lead you have; call, email, set meetings, or send direct mail. You may not be able to reach every lead but at least you know that you hit as many as you could. What can also help you in your outreach efforts is organizing your leads and prioritizing them from hottest and coldest and following-up accordingly. You will get a huge boost in ROI by doing this, and you will prove you the value of your face-to-face marketing efforts. To get the most out of exhibiting at a trade show you need to pick the right one to begin with. If your industry only has one worthwhile trade show great the work has already been done for you – but typically this is not the case. When you are choosing which trade shows to exhibit at you need to take a few things into account so that you get the most impact possible. Firstly, look at which shows most of your competitors are attending and make sure you are there as well. If you miss out on shows where the majority of your major competitors attend then it will make your organization look like you are not a big player in your industry. You are at trade shows to get leads so look to exhibit at shows that have to most decision-makers at them and secure the highest quality leads for your sales force. Lastly, look for shows that have the best inter-industry networking opportunities because exhibiting is not only about driving up sales, it can also be an opportunity to learn and make great connects. Becoming a great exhibitor can take time – but in the long run once you gain the right touch you will see your dividends increase across the board. Be smart, plan carefully and above all remember to have fun and put yourself out there.